Recently, I had to get new siding and windows for my house. That is a much more expensive up-date then I had originally anticipated. Saving money to be able to pay for the siding will become a very important consideration especially in the upcoming months (years?). I know that owning my own home is a very large investment and the siding and windows were very necessary and important investment in my home. But another significant investment is clothing. With today’s world of fast fashion, clothing is looked at as disposable. Even though I sew, I probably still have that mind set. However, I will have to put forth a more contentious effort of making what I have last longer and reducing cost. Strategic sewing will help reduce cost like sewing bras (there will be a significant savings). But, what I really need to focus on is making what I have last; especially those items I don’t really make right now like sweaters or pants. The only age I know where this was essential is World War 2. There are probably others, but those time periods didn’t advertise it as heavily or put out as much public information. In the end, I may only end up with learning how to mend as the only applicable to my life option from this little excursion to the 1940s. However, there may be other ideas that I can apply to my life to hopefully help me with the care of clothing. Also, I may expand this effort to other areas of my home and blog it here in case anyone is looking for ideas. 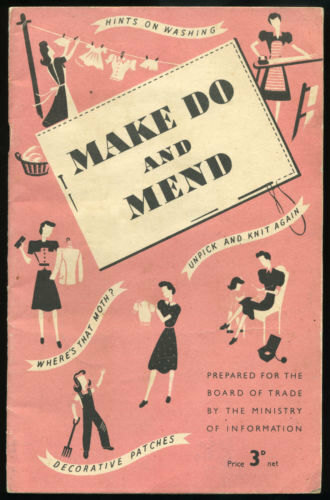 I will start with Ministry of Information’s 1943 leaflet Make Do and Mend. This post will only cover the To Make Clothes Last Longer sections: “Tips on Taking Care of Clothes”, “How to Store Clothes”, and “The Moth Menace”. First off, my overall impression from this section is planning and organizing is key. So it may be worth my time and money to invest a little here in organization while I still can so that I have the basics. As of right now, my closet probably falls under the category of being a mess. It would probably give a 1940’s housewife a heart attack. I thought about putting a picture of my closet in the post, but in the end it just felt too personal and unsafe thing to do. I understand that a typical 1940’s housewife may not have the option as I do to right now of investing in organization, but hopefully it will end up being money well spent. “Tips on Taking Care of Clothes” is probably the most useful part right now from the three. The one I never really thought about was mend your clothes before washing. I don’t always make time to mend something so I will often throw it in the wash; so it can be clean while it is waiting to be mended. Tip three was don’t throw your clothes in a heap. I will have to try to work on this one. Right now, I will admit I am very guilty of putting clothes in a pile on the dresser and putting them away later when there are more items. Tip five was removing stains when they occur and tip eight is never let any clothing get really dirty. Usually for my clothing, I just pre-treat then put the item in the hamper. Another helpful hint was using clean white blotting paper and an iron to get out grease stains. Right now, if a stain doesn’t come out after wash (usually grease related), I soak the item in Oxy-clean. An iron and blotting paper may be gentler on the fabric. The last tip was using dress shields. After a quick look on the internet, it looks like most of the dress shields ready available now are adhesive based. I honestly am not sure if the adhesive would pull fibers out of the fabric and cause wear and tear on the fabric. If that happens then you are looking at having to mend wherever the adhesive is at. This tip may just be obsolete based on our modern convenience society or require more searching. “How to Store Clothes” stresses that you need to make sure everything is clean before storing it, do not store in a damp place, and tacking down features like pleats, pockets and plackets. The other tips included storing clothes uses newspaper to protect the clothing from creasing when it is folded or hung which don’t make much sense to me. Wouldn’t ink from the paper get onto the clothing and ruin them? I know that there are occasions where ink gets on my hands when I am folding up the newspaper for Lala’s litter pan. “The Moth Menace” section kind of made me wonder if I really don’t realize that I have moths ruining my clothes or that moths just don’t live in Kansas. I keep envisioning an army of moths waiting for the 1940’s housewife to close the wardrobe door before they invade. As I have severe allergies, I cannot follow the recommendation of airing your clothing out in the sunlight outdoors. It also recommends cleaning out and scrubbing the closet and drawers. Make Do and Mend doesn’t give exact guidelines on how often to scrub down closets/ drawers, but going off the first bullet, is it supposed to be once a month when you air your clothing outdoors in the sunlight? Only the second tip was very useful as it gives a general description of moth grubs and eggs plus how to remove them from clothing. Overall, this section wasn’t as helpful for me and I may look more towards modern methods of moth control. Before moving on to the next section, I will need to look into some more organization for my closet, modern means of moth prevention, making a laundry folding aid ( I will try to post how I made it), and a general closet clean out. 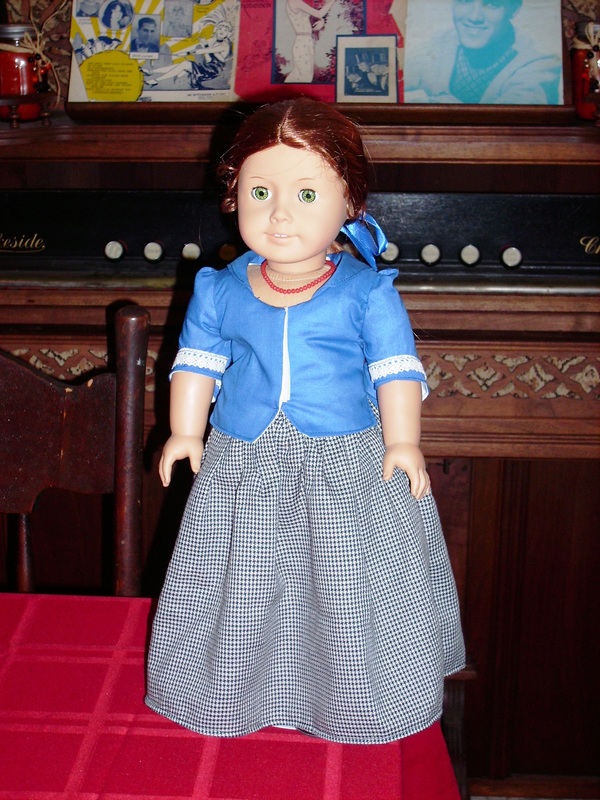 After Rebecca, Felicity was up next for a new outfit. I had seen Jessa’s version of Thimbles and Acorns’ 18th Century Hooded jacket so that plus that the pattern is rated as easy seem to seal the deal as that is what Felicity was going to get for the new outfit. My friend Annette had given me some lovely scraps of fabric at one of our Christmas parties for KC Pinheads. If I remember right, I think she said that the fabric I ended up using for Felicity’s skirt is an Italian wool?. Anyways, the skirt was very simple to make. It is gathered rectangles on a waistband. Now, I determined I don’t care for the instructions of sewing ties into the waistband and then tying the skirt shut on both sides. So I decided to use Velcro on one side only. The other side’s waist band was sewn closed and the pocket opening sides were stitched down. So the pocket opening is still usable (if Felicity had pockets). As for the jacket, I had planned on using the skirt fabric to make the hood. But the more I thought about it; the more I came to realize that doing that would limit the versatility of having separate pieces. In the end, I decided to use the blue cotton voile for the collar and outer fabric and the white quilting cotton for the lining. 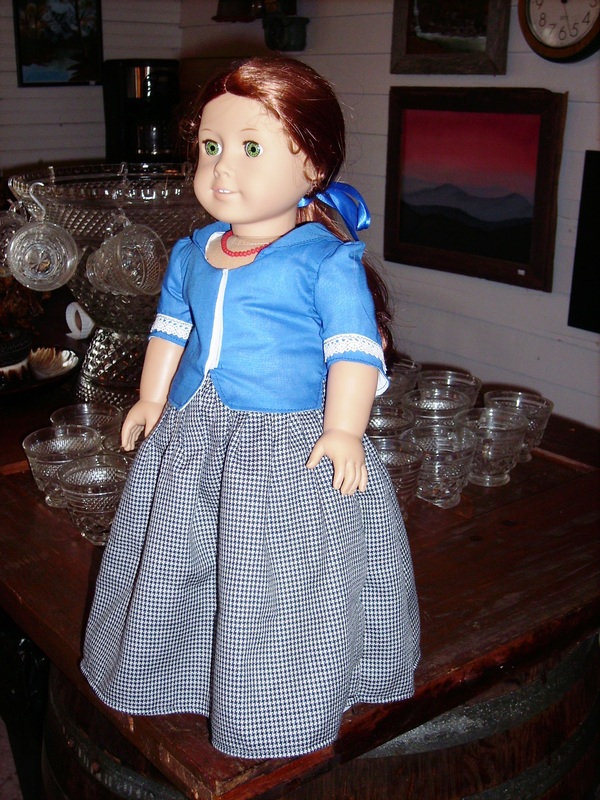 Maybe if I scour my fabric stash some more, Felicity could have another skirt to coordinate with her blue jacket. Again, I changed the closure of the jacket from laced/ hooks to Velcro. Since I made that change, I used a narrower seam allowance on the front of 3/8 inch instead so the fronts would overlap. Lace was subbed in for the soutashe on the sleeves. I had a little bit of trouble with the sleeves. I was under the impression that the whole jacket was being turned through the bottom of the sleeve then hand sewing the bottom of sleeve closed. So it would be making complete outer and complete lining then put them together. But the instructions have you turning through the armhole at the shoulder area. I had to remove my sleeve and redo them. Then after everything was finished, the arm shoulder/ sleeve seam was hand sewn shut. 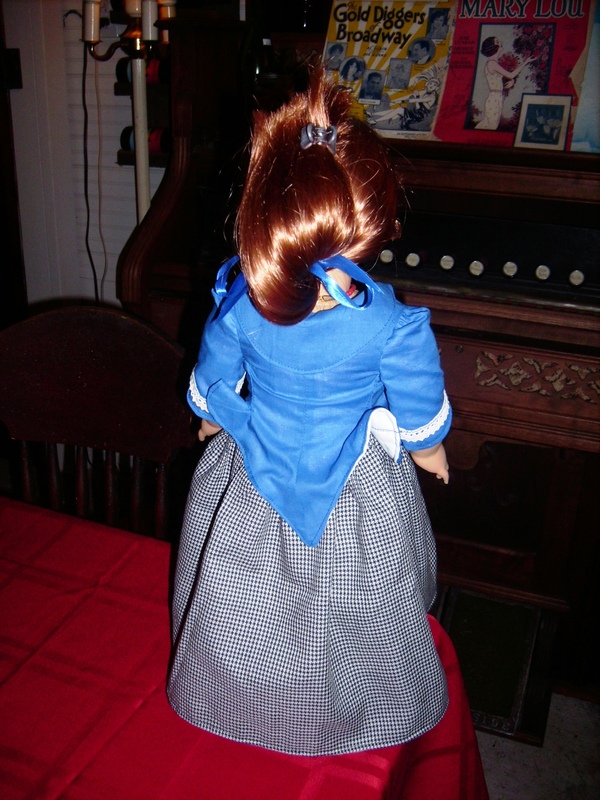 In the photos, Felicity is wearing her original shift (chemise) from American Girl under the jacket and skirt. To be honest, the jacket is a bit tight in the upper arm area because of it. I almost wonder if I had finished my seams with the serger, I may have been able to skip the hand sewing and maybe get a little extra ease at the armhole. 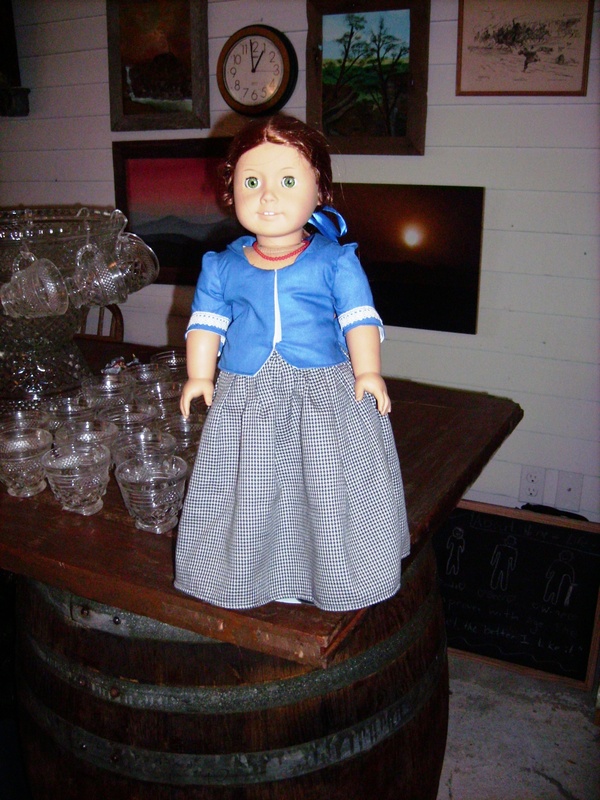 Felicity was so fortunate that my friends at the New Lancaster General store let her have a photo shoot in their lunch area/ overflow tasting room when my parents and I visited before Valentine’s day. One three more dolls are waiting for new hand-made outfits: Samantha, Molly, and Melody. But for now, they will have to wait until a few other projects are completed first. 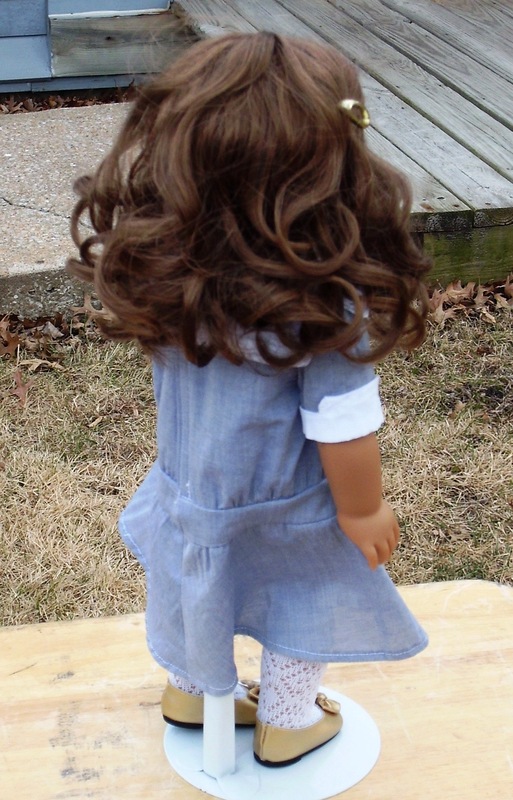 So moving along in my American Girl doll collection, it was Rebecca’s turn for a new dress. So Simplicity 1179 is another of the Keeper’s Dolly Duds patterns for Simplicity. I honestly don’t know what the light blue fabric is, but based on drape, I think there is some rayon in it. This was probably a bit light for the pattern. 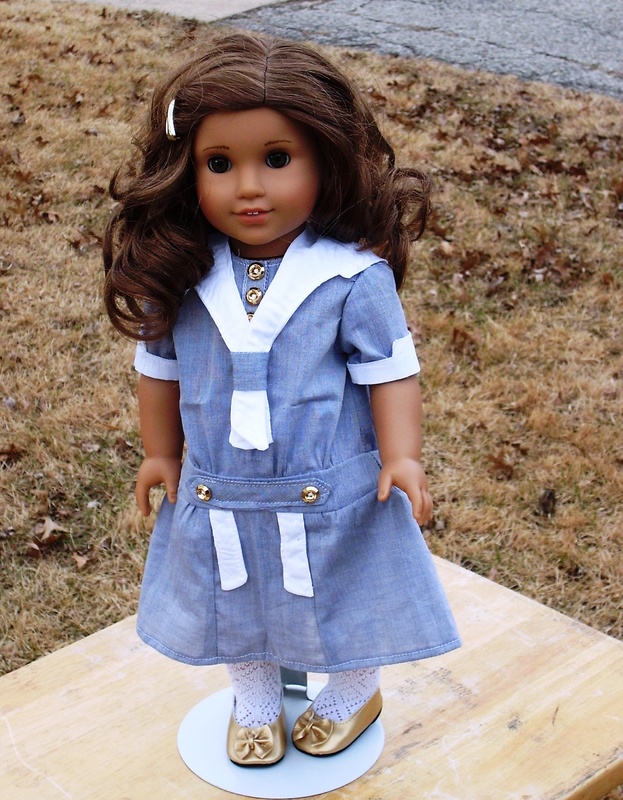 The white fabric used for the sleeve accent and collar is a quilting cotton. The pattern instructions are well done and easy to follow. I probably err on the side of simplicity as I didn’t use all the buttons that the pattern request. 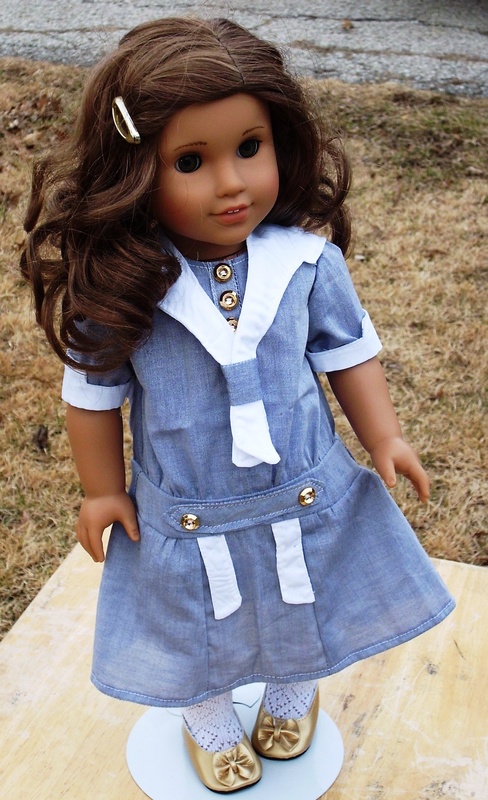 My version is missing the buttons on the sleeves, and on the collar. I reduced the number of buttons on the placket to three because I used a 3/8 inch buttons instead of 1/4 buttons. That was mainly because I wanted gold buttons. I used Velcro to close the back of the dress instead of buttons which are mentioned on the pattern. I have probably about 20 yards left from the 25 yard roll of Velcro I bought from Etsy last year. As always with Keeper’s Dolly Duds patterns, the pattern is well drafted. However, it may just be me, I feel like the waistband is a little low. I know it is a dropped waist style; but Rebecca looks like she has a saggy waistband in the back. I think the next time I make this pattern I may take in the waistband to see if that helps out the saggy backside. 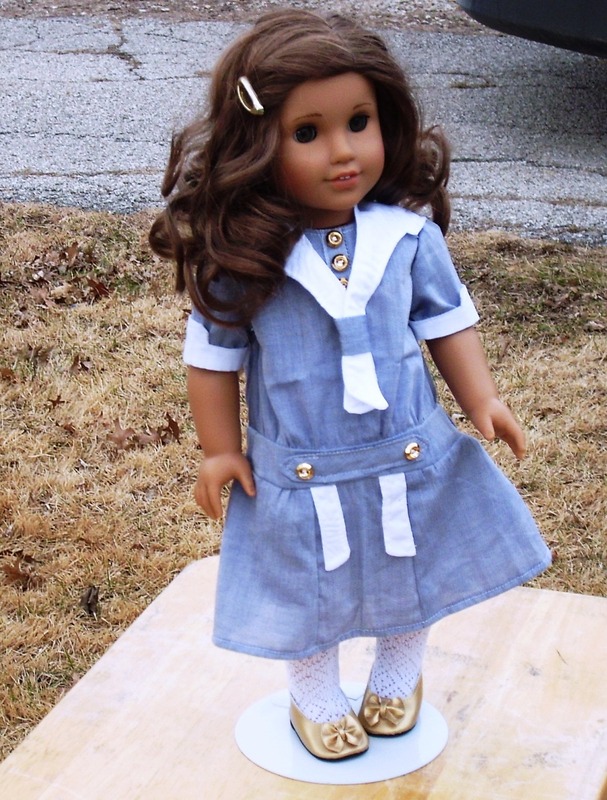 As Samantha is still needing a new dress, I may come back to this pattern and try out either view C or view D.
I will always go put a potential craft project in Google to see what others have made (I even Googled Kit’s overalls before making). It doesn’t stop me from making what ever the project is if there isn’t a review. 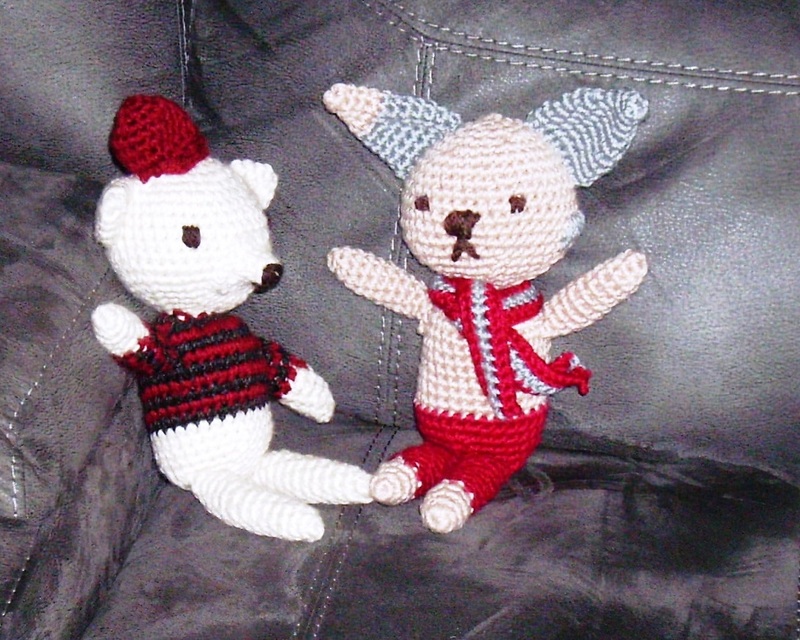 The kit my sister gave me “Crochet Animal Pals” for Christmas was no different. I couldn’t find any reviews for this kit. 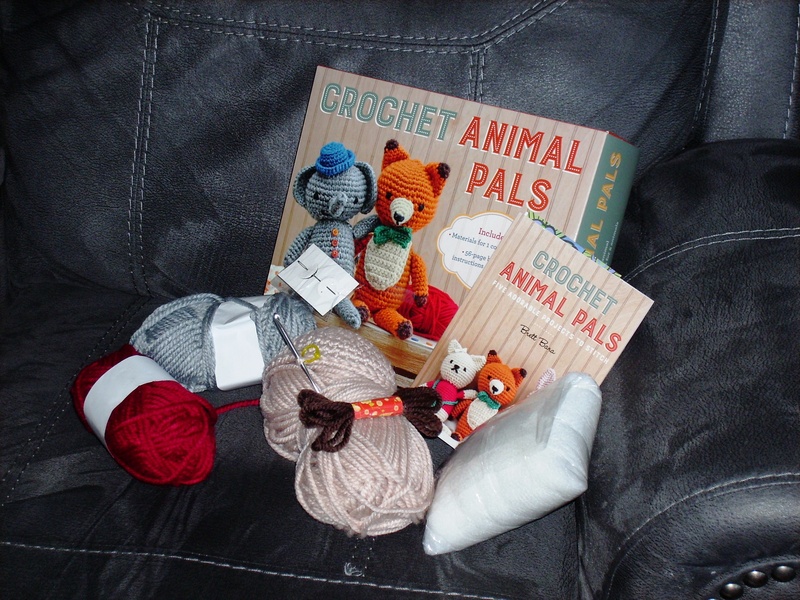 The kit includes 3 balls of yarn (plus some dark brown for the face embroidery) for one animal, a 4 mm crochet hook, a tapestry needle (which may be a little small for the thick yarn), and a book of instructions for 5 animals. The animals include a bunny, bear, fox, cat, and elephant. 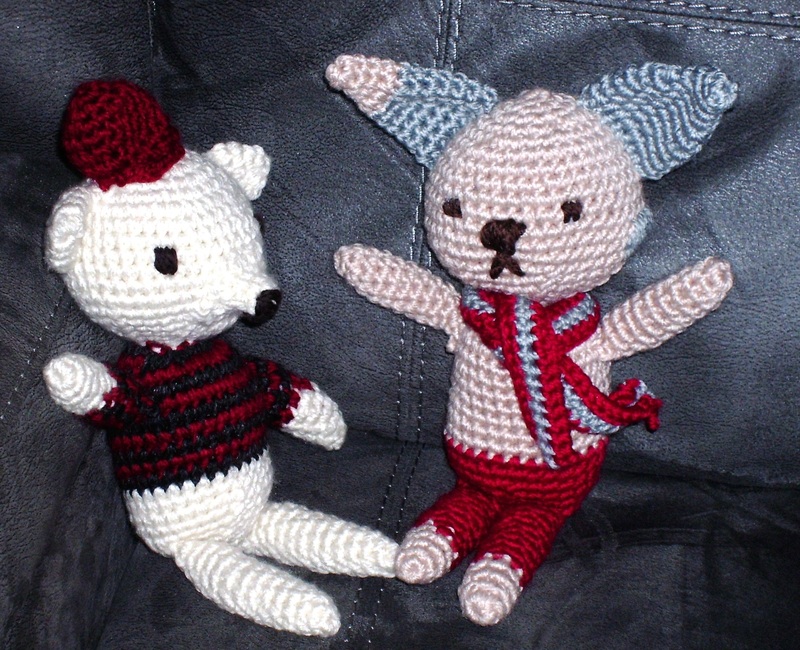 If you follow the instructions to the letter, the included yarn can only make a bunny or a bear. The instructions tell you all materials included in the kit for bear and bunny. Otherwise, materials are listed out for the other animals. I was torn as to whether to start with the bear or the bunny. In the end the bunny won out, but I started and figured I had up to round 19 to decide. The basic pattern for the body and head is very easy to follow. I didn’t have any troubles at all. Just be sure to count stitches as you go and to mark down which round one finishes. Flipping back and forth in the book, you find the instructions for the arms, legs, ears and tail. All those instructions were easy to understand also. In the end, I didn’t have enough tan yarn to make my entire bunny. I would have been short 1 ear and a tail. So that is why the one ear has grey and tan and the other ear is solid grey. I also tried to sew a couple of grey spots on the body so that the grey ears and tail didn’t look out of place. Also, I didn’t have enough stuffing for the entire rabbit too. I really wanted to make the bear also. So right after finishing up the rabbit, I got the supplies for the bear (using the other patterns to estimate how much yarn I would need). This time I used Premier Yarn’s Deborah Norville Collection’s Serenity chunky. 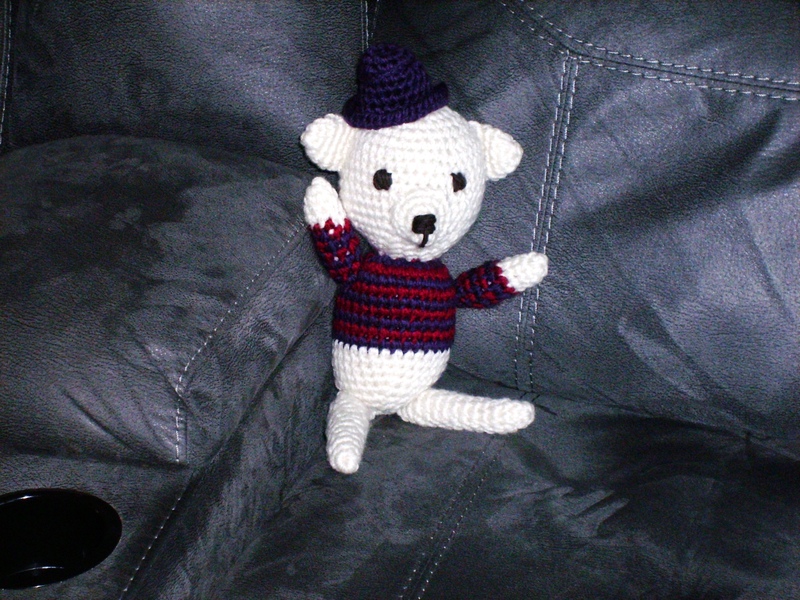 After finishing up the bear and weighing the amount of yarn (cream) left from making the bear body, I had just 0.8 oz of yarn left. 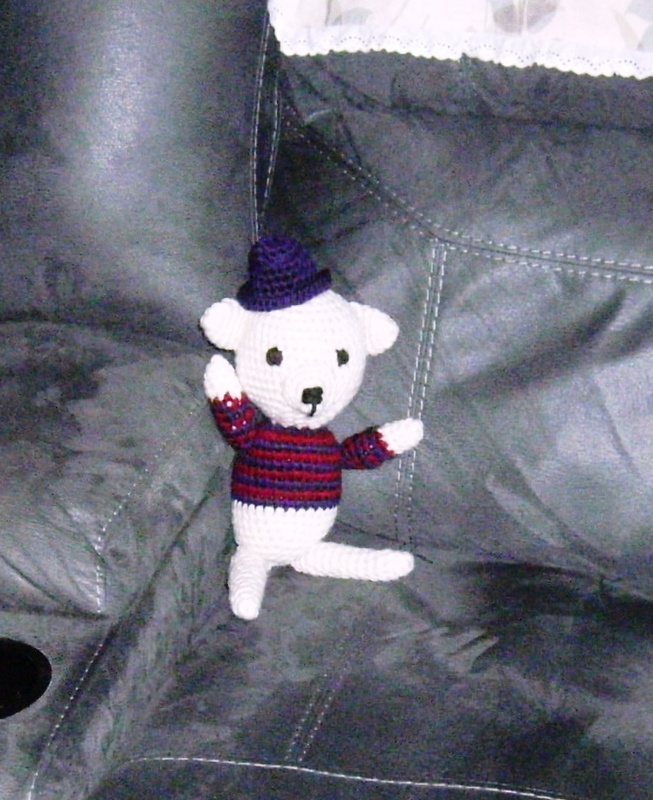 Doing the math, I determined the bear used 85 yards of yarn to make the bear. I really didn’t like how the bear’s hat is done. It was sort of confusing when it came time to make the brim of the hat. Now time for the one I made my mom. She decided on a bear also with a striped sweater. But I decided I wanted to use the hat that went with the elephant instead. I have double checked my math and I believe there is a typo in round 9 on the elephant’s hat. The total I come up with is 36 stitches at the end, not the 41 in the book. My hat does look like the one in the book. I have e-mailed this to Sterling Publishers but have not heard anything back yet. I will up-date the blog post if I do. I just finished the third one for my mom over the weekend. I really enjoyed the kit and will keep using the patterns in the book.